Your device uses a nano SIM card to provide you with access to your wireless service providers 4G LTE cellular network. Warning: The SIM card information and its contacts can be easily damaged by scratching or bending, so be careful when handling, inserting, or removing the card. Keep all SIM cards out of reach of small children. 1. Insert the SIM tool into the SIM card tray at the top of your device, and pull on the tool to remove the tray from the device. 2. 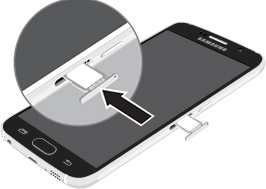 Insert the SIM card into the SIM card tray, and then push the SIM card tray back into your device.